T-shirts will be available at the fest with our logo on front (design is one color dark green, not 2-colors as pictured) and our sponsors from 2015 on the back. $8. 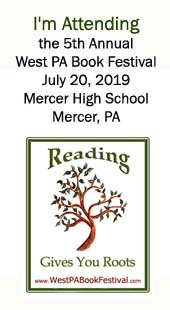 Proceeds support the Book Fest. The shirts are American made and printed with high quality material. 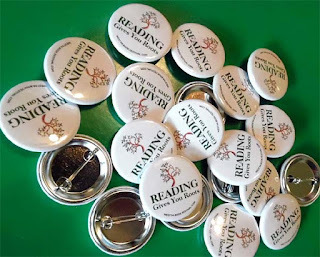 These mini buttons will be available 1 free with any book purchase while supplies last. These tote bags were our 2016 giveaway with purchase. In 2017 our giveaway bags were dark teal green rather than this light green. We have some of both still available, with book purchase or for a $2 donation. We also have a few stylus pens available for a $2 donation. As every year, we'll be handing out free pencils with: Reading Gives You Roots, Writing Gives You Wings imprinted. We will also have a handful of these full color weather resistant bumper stickers at the fest for $5 each. If you prefer, you can order directly from Zazzle.